The classic, contemporary design of each of our suites and apartments reflects a sense of understated luxury and sophistication. We offer an unrivalled selection of one and two-bedroomed accommodation, which includes adjoining suites for families. Whether you’re travelling for business or pleasure, we’ll ensure your time at the Two Seasons Hotel & Apartments is relaxing and comfortable. Choose from an uninterrupted view of the city or sea and your own private balcony. 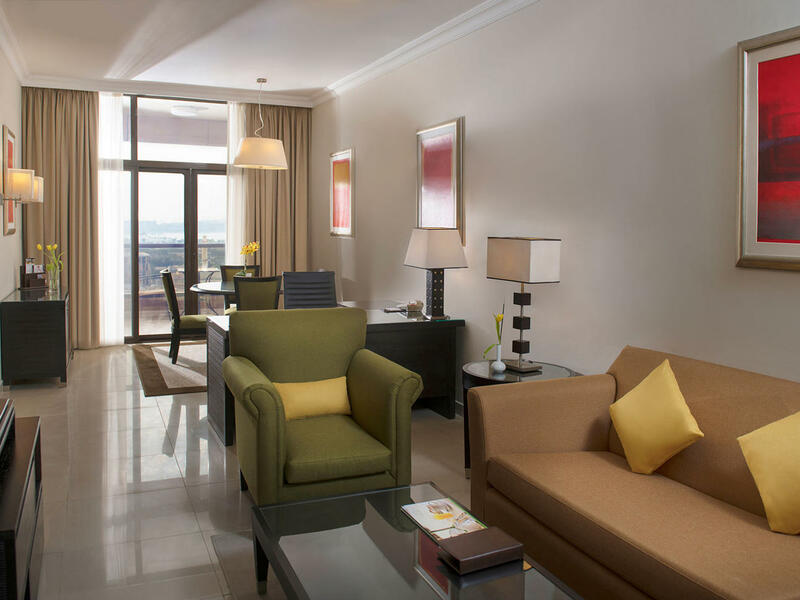 Complete with large twins or a king-size bed, a spacious living area, office facilities and a kitchen area, the range of deluxe, premium or grand suites or apartments caters to your individual needs. Two Seasons Hotel & Apartments has all facilities to cater to the needs of traveling executives, families, holidaymakers as well as long staying guests. With its contemporary style, this 41-storey property features 1010 one-bedroom and two-bedroom suites and 4-star award winning apartments in Dubai. Some of them can be adjoined into 3-bedroom suites to facilitate larger families. Sized from 58sqm to 102sqm, all suites and apartments offer spacious settings including living room, one or two bedrooms, enclosed kitchen with microwave oven and refrigerator, one or two full bathrooms and luggage room. 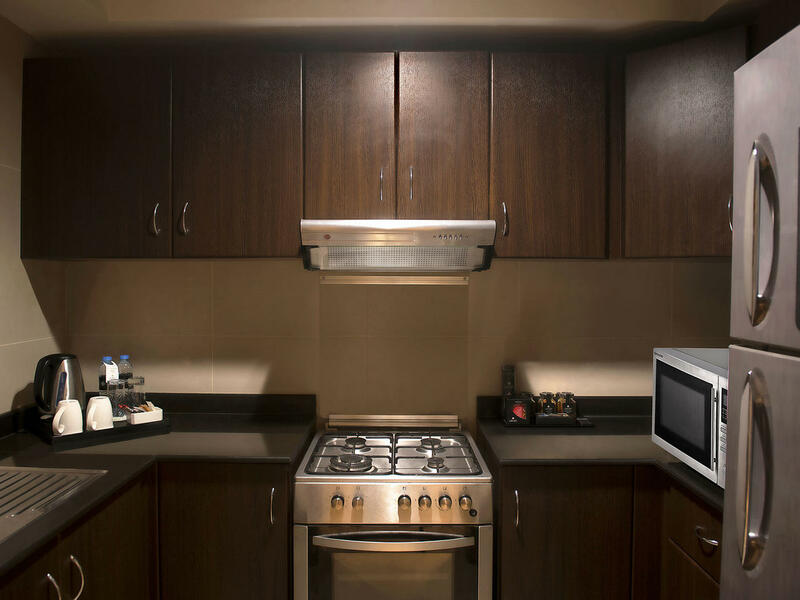 Additionally, 2-bedroom apartments feature dishwashing machine, while our hotel apartments dedicated for extended long stays have a cooking range and a laundry room with washing machine and ironing board with iron. Sofa bed is an additional facility available on all suites and available only in two-bedroom apartments. The 16 disabled friendly rooms with both sea view and city views are equipped with walk-in shower, grab bars closest to the side wall of the toilet and panic alarm. 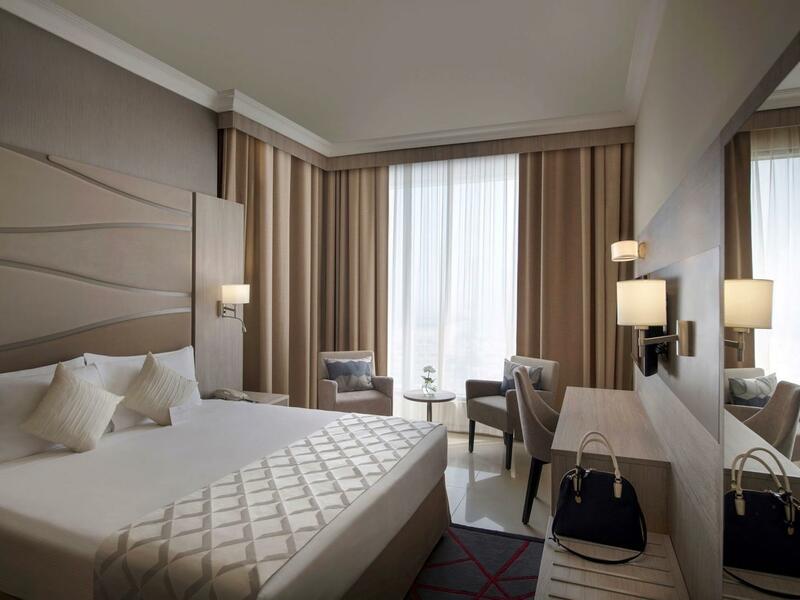 Enjoy beautiful views of the Dubai city skyline in our 58sqm deluxe suite. Our Deluxe suite is an ideal accommodation for an individual traveler or a couple, boasting a comfortable living room with 40-inch TV, master bedroom, kitchenette, 1 full bathroom and luggage room. Complimentary Wi-Fi is provided during the stay. Whether on business or holiday in Dubai, guests will enjoy the comfort and stunning views of iconic Palm Island and seafront from our 70sqm premium suite. It has a full private balcony, comfortable living room with 40-inch TV, master bedroom, kitchenette, 1 full bathroom, luggage room and complimentary Wi-Fi provided during the stay. Enjoy beautiful views of the iconic Dubai city skyline from your full private balcony in our 70sqm premium suite. Our premium suite is an ideal accommodation for individual traveler or a couple, boasting comfortable living room with 40-inch TV, master bedroom, kitchenette, 1 full bathroom and luggage room. Complimentary Wi-Fi is provided during the stay. 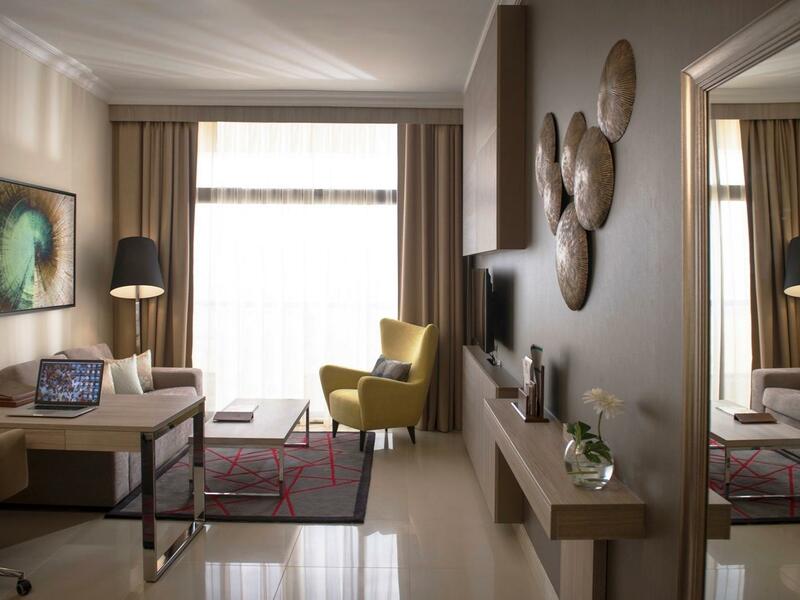 The 102sqm Grand Suite is a two-bedroom suite that will be perfect accommodation for a family coming for holidays. It has a comfortable layout complemented by 2 private balconies with breathtaking city views. 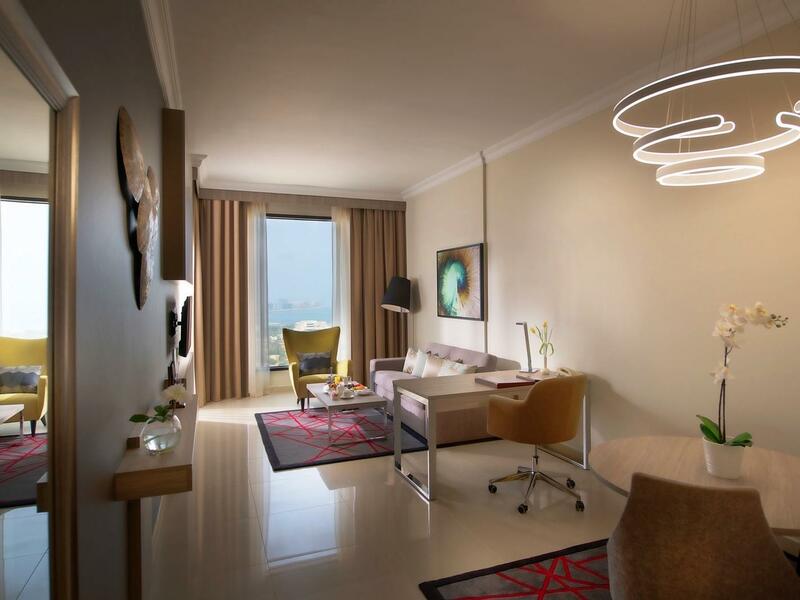 The guests will enjoy a spacious living room with 40-inch TV, kitchenette, two full bathrooms and luggage room. There is complimentary Wi-Fi provided during the stay. Some of our one and two-bedroom suites can be adjoined allowing to accommodate a larger group of travelers. 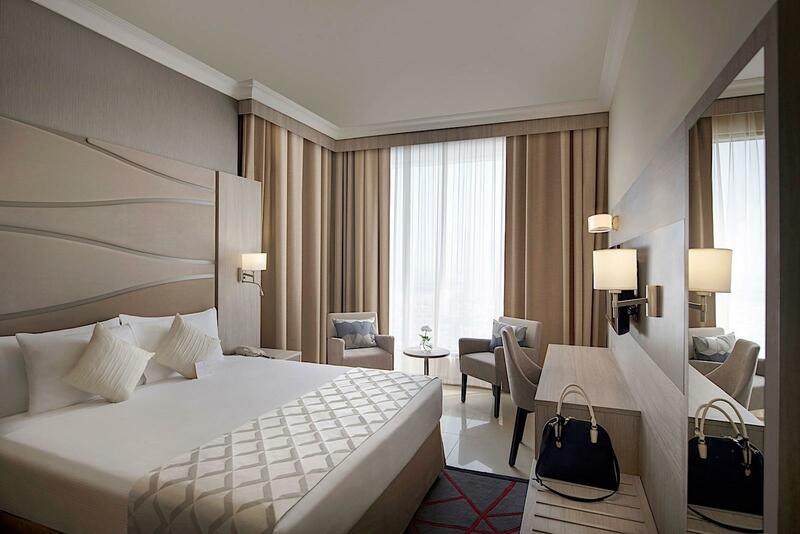 Offering spacious living and stunning views of the iconic Palm Island and seafront, our 102sqm Grand Suite is a two-bedroom suite that will be an ideal accommodation for a family coming on holidays in Dubai. It has a comfortable layout complemented by a private balcony with breathtaking seafront views. 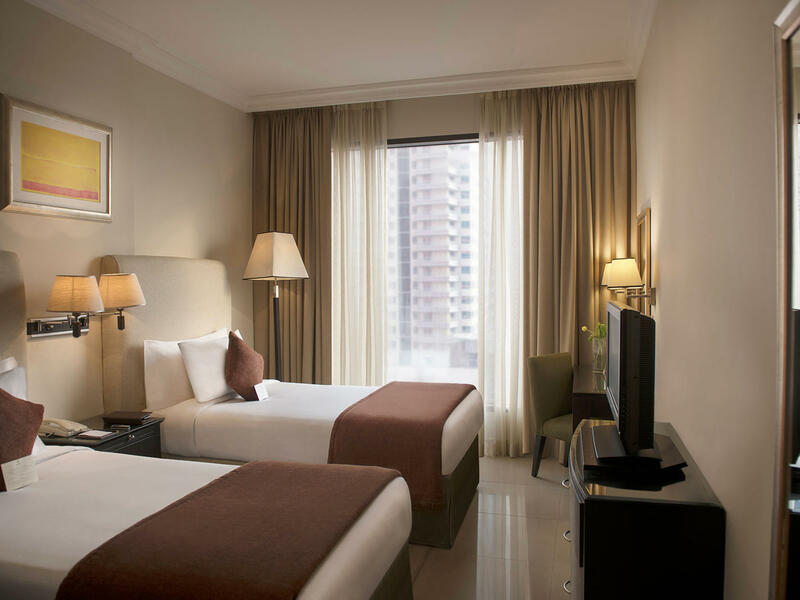 The guests will enjoy a spacious living room with 40-inch TV, kitchenette two full bathrooms and luggage room. There is complimentary Wi-Fi provided during the stay. Some of our one and two-bedroom suites can be adjoined allowing to accommodate a larger group of travelers. Enjoy beautiful views of the Dubai city skyline in our 70sqm One Bedroom City View Apartment. It has a comfortable living room with 37-inch TV, master bedroom, fully equipped kitchen, 1 full bathroom and laundry room. 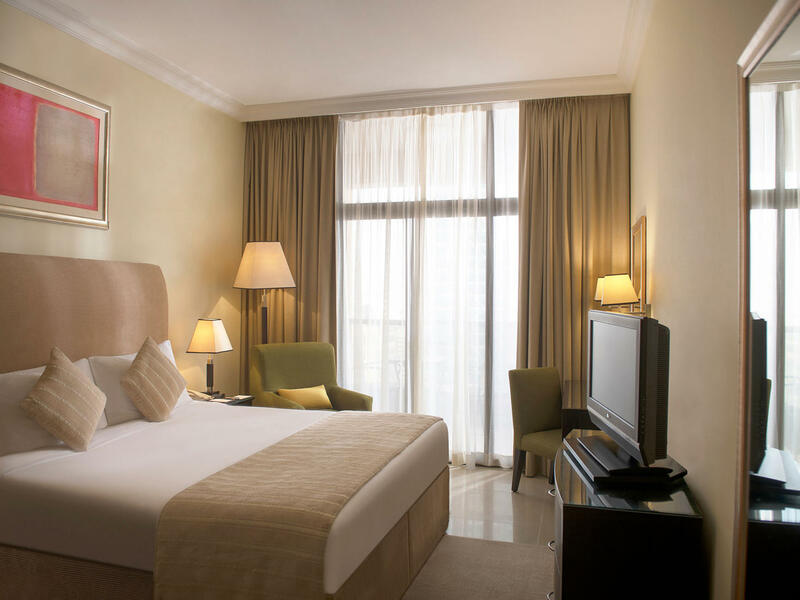 Stay at a One Bedroom City View Apartment at Two Seasons Hotel & Apartments in Dubai and enjoy all the comforts of home with all the convenience of a hotel facility. Whether on business or holiday in Dubai, guest will enjoy the comfort and stunning views of iconic Palm Island and seafront from our 70sqm One Bedroom Sea View Apartment. It has a full private balcony, comfortable living room with 37-inch TV and internet, master bedroom, fully equipped kitchen, 1 full bathroom and laundry room. There is complimentary Wi-Fi provided during the stay. The 102sqm Two Bedroom City View Apartment will be perfect accommodation for a family coming for holidays or extended long stay guests. It has a comfortable layout complemented by 2 private balconies with breathtaking city views. The guests will enjoy a spacious living room with 37-inch TV and internet; 2 bedrooms, fully equipped kitchen, two full bathrooms and laundry room. There is complimentary Wi-Fi provided during the stay. Offering spacious living and stunning views of the iconic Palm Island and seafront, our 102sqm Two Bedroom Sea View Apartment will be an ideal accommodation for a family coming on holidays or for a long stay in Dubai. It has a comfortable layout complemented by a private balcony with breathtaking seafront views. The guests will enjoy a spacious living room with 37-inch TV and internet, 2 bedrooms, kitchen with a balcony, two full bathrooms and laundry room. There is complimentary Wi-Fi provided during the stay.